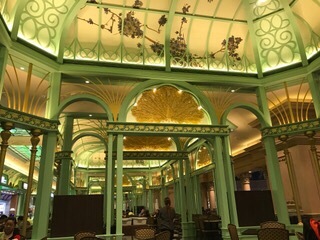 Since we had seen a lot of Hong Kong but had never been to Macau, we got up very early, had breakfast in the room and ventured out for a day trip to Macau. Typical Hong Kong weather of rain! 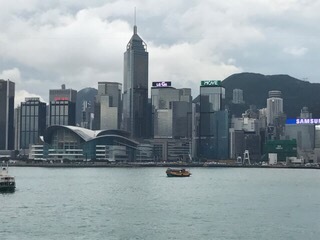 We took the Star ferry to Hong Kong island (50 cents US! ), and then the turbojet ferry to Macau. It takes an hour and today was delayed because of the fog in the harbor. We did have to go through immigration on the ship and get our passports, then go through when we reached Macau. Luckily they had a line just for senior citizens and the handicapped because the other lines were LONG! We got through very quickly – I don’t think I have seen that kind of special treatment in other places. We decided, since it was pouring, to go and see one of the new casinos, the Parisian. 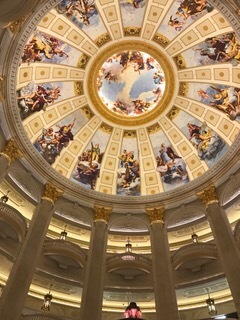 It does compare with the one in Las Vegas – huge, connected to the Four Seasons and the Venetian, and about a 15 minute bus ride from the ferry terminal. The casinos are quite spread out here, but never fear, they all have free shuttles! 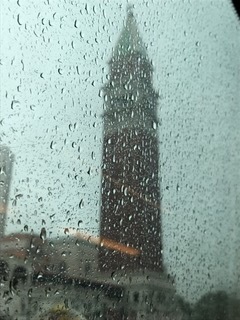 You can see the tower at the Venetian picture just how much it was raining! 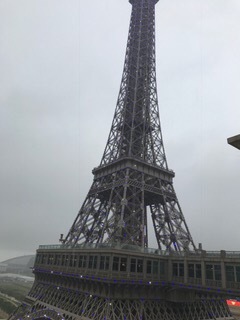 We had lunch at the Parisian but did not go up in the tower because visibility was so poor – even though we had a free entrance ticket. 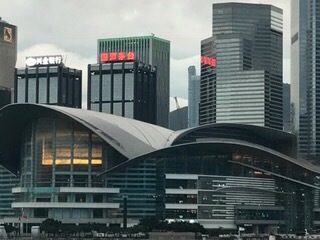 I was going to gamble a bit, but the minimum at the tables was $300 Hong Kong which was about $38 US – too much for a hand of blackjack, in my opinion. I did watch though, they have some unusual rules. I couldn’t quite figure them out, all kinds of extra bets and other people can bet on your hand!! I couldn’t even decipher what the chip denomination was. 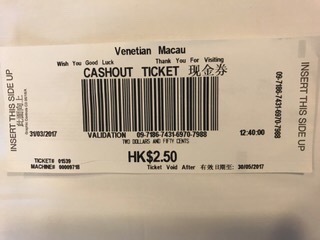 So, I put $50 Hong Kong in one slot machine (about $6.50 US) and came out with $2.50 Hong Kong (about 32 cents US). So I kept the ticket as a souvenir. I was a very big spender here…. Macau is billed as the Las Vegas of the East – and it is not far off! We didn’t get to see the old Portuguese area as the weather was too bad. But the wealth and the casinos were something to behold. Very large and glamorous. I didn’t see too many Americans there. They are building a bridge over from Hong Kong which is very long and could take 4 hours to drive. In Macau there is a parking lot being built for those travelers who, we heard, will not be allowed to drive there but will need to park in that lot. A lot of building and upgrading of the casinos is going on. A veritable money machine there. We took the ferry back – again, the same immigration line, and we also had to meet with the immigration officials on the ship to check in and give our passports back. For sail away, we were invited to Alan and Beverly”s suite where we enjoyed canapés and drinks – the sun came out briefly but it was a cloudy sailaway. 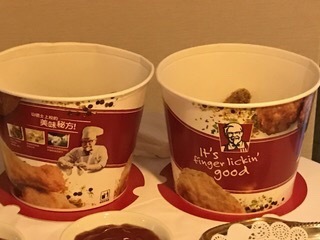 They had also bought KFC (very big in Asia) so this counted as dinner! Next day at sea then we arrive in Halong Bay Vietnam where the weather forecast is for beautiful weather. This entry was posted in Asia, Excursions, March, World Cruise 2. Bookmark the permalink.